Ordinarily, when a burger joint boasts, on its signage, that it's the best, one can expect a craptastic mess and a howl of outrage from TheBurgerBusters. This was not one of those instances. 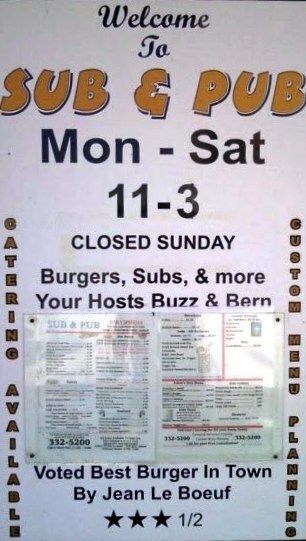 Sub and Pub was only open for a couple of hours a day, and the menu was just standard bar fare for downtown office workers, but they nailed the burger. Pictured here is a damn fine burger. The price--about 7 bucks. They made the loosely-formed patties with lean, aged beef, so order the 1/2 pounder to avoid the dryness that came with small, lean, thin patties. They cooked them to Medium, and that worked with the not-especially-absorbent Kaiser roll. The two slices of American cheese made up for the lack of seasoning and lent the proper creaminess to the lean beef. They gave it a nice, but not robust, sear from the griddle, and it showed up hot. 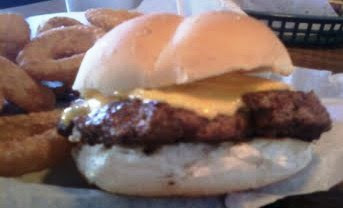 In spite of this burger's flaws, it still delivered the total package of cheeseburgery goodness. Aged beef funk and flavor, gooey cheese, and a bun that tied it together without stealing the show. Burger Review : This was the best burger in this small town. This place was not on my list for burgers till now. Try Naples' Riche's Restaurant, a mom and pop shop for great huge luscious burgers. I also like the $3 burgera at happy hour at Mccormick and Schmick, a chain. Price is right. Lindburger's are so-so. Keep up the great work on burgers.